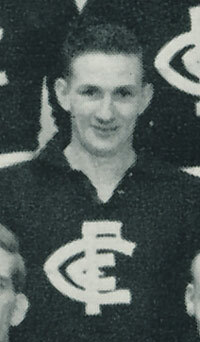 Jim Baird was a two-time VFL Premiership player for the Carlton Football Club, and one of the great all-round sportsmen of the post-World War II era. In 1945, he played in defence for the Blues in the infamous ‘Bloodbath’ Grand Final against South Melbourne, and two years later, booted three goals at full-forward when Carlton snatched a famous last-minute victory over Essendon in the 1947 decider. En route to that dual flag glory, he scored ten goals in a game against Richmond in 1943. As well, he was a tearaway fast bowler in two District Pennant teams for the Carlton Cricket Club, and finished third in the 1946 Stawell Gift. Nicknamed ‘Bones’ – probably because of his lean, athletic build – James George Baird was born in inner-western Melbourne in 1920. Later on, his family moved to Clifton Hill, where young Jim was an outstanding schoolboy athlete. On the football field, those qualities combined into a player with dash, versatility, balance and outstanding endurance. He was invited to Princes Park in 1941 from Princes Hill, and fast-tracked into a Carlton side that had been seriously weakened by the rush of experienced players volunteering to fight in World War II. At first he was seen as a fast-leading full-forward, especially when he single-handedly destroyed Richmond at Princes Park in the opening round of 1943. Using his speed and agility to the full, he ran the Tiger defenders ragged that afternoon, to become the first-ever Carlton player to post 10 goals in a match against Richmond. However, despite that brilliant effort, Baird couldn’t maintain consistency for the rest of that year. Overall, he managed only five games and 15 goals, before wartime duties took him away from the game for all of the 1944 season. When he did resume his career with the Blues in 1945, coach Percy Bentley had had a rethink, and this time played him primarily as a follower-defender. Bentley wanted Jim to use his pace to set up play from deep in defence, and instructed his team-mates to give Baird the ball whenever he broke into space. From then on, Jim became something of a prototype of today’s hard-running, creative backman. Carlton’s fabled 1945 Premiership – won from fourth place on the ladder - was anchored by a superb defence. With a young champion in Bert Deacon at centre half-back, flanked by the legendary toughness of captain Bob Chitty, and three talented speed machines in Jim Clark, Vin Brown and Jim Baird, the Blues first beat Collingwood in an ill-tempered, often vicious Semi Final, before accounting for South Melbourne in a Grand Final forever afterward remembered as the ‘Bloodbath.’ In all, nine players were reported on that explosive afternoon (as well as another who was already under suspension, but jumped the fence to join in the fighting). Baird stayed out of the firing line and was quietly effective. Carlton won most of the fights and the match, to claim our seventh VFL Premiership. In 1946, the Blues suffered a massive Premiership hangover and tumbled down the ladder to a sixth. Earlier in the year, Jim Baird and Vin Brown both made it through to the final of Australia’s most prestigious professional foot-race; the Stawell Easter Gift. Baird came off the 3-yard mark, and was narrowly beaten into third place. Later, when the football season ended and cricket took the sporting spotlight, Baird led the bowling attack for Carlton in the VCA, and helped his team to the first of two successive District championships. The Blues were given a huge boost prior to the start of the 1947 VFL season when the brilliant West Australian Ern Henfry was appointed captain of the Blues – after having played just two VFL games. Although controversial, it proved to be an inspired decision by the Carlton match committee. One of the all-time great centremen, Henfry led the Blues to the top of the ladder after the home and away rounds, to set up a Semi Final clash with Essendon. Late in the season, regular full-forward Ken Baxter had twisted a knee and was reported to be out for the rest of the year. In his place, coach Percy Bentley swung Baird back to the goal-front, and Jim responded by recapturing his earlier goal-kicking prowess. His three majors in Carlton’s 16-point victory over the Bombers was a good contribution, and sent the Blues straight into our second Grand Final in three years. When Essendon narrowly beat Fitzroy in the Preliminary Final, Carlton firmed into flag favouritism – especially when Baxter made a surprise recovery and trained freely in the lead-up to the decider. Carlton stuck with Baird at full-forward however, and named Baxter on the bench as 19th man. To their credit, a somewhat depleted Bomber team served it up to the confident Blues in the ‘47 Grand Final, and only Essendon’s dreadful inaccuracy around the goals kept Carlton in contention by the last change. With less than a minute left, Essendon were grimly hanging on to a five point lead, when the ball spilled off a pack in Carlton’s forward pocket. It was then that rover Fred Stafford swooped - and goaled - to give the Blues victory by the tightest of margins. Henfry, and followers Fred Davies and Jack Bennett were Carlton’s heroes in that miraculous win, while Baird was lively up forward with another three-goal haul. From then on, Jim Baird spent the last four years of his career at Princes Park almost exclusively in defence. From 1948 to 1951, he was part of one of this club’s great half back lines, alongside Bert Deacon and Jim Clark. They played in another Grand Final together in 1949 – once more against Essendon – but this time the Bombers were far too good, and hammered the Blues by 73 points. Remarkably, Essendon featured in milestones throughout Jim Baird’s career. He made his senior debut against the Bombers, and faced them in two of his three Grand Final experiences for a 1-win, 1-loss result. Perhaps it was fitting, then, that he should play his retirement game against the red and black in the final round of 1951 at Princes Park in September. Jim Clark also finished up that day, but sadly, the Blues couldn’t send two of the club’s favourite sons off with a win. After clearing out his number 25 locker at Princes Park (the one that so proudly wears his name to this day) Jim went to Federal League club Mentone as captain–coach for the 1952 season. Afterward, he lived a long and robust life until his passing (just five days short of his 83rd birthday) in November, 2003. In 2006, ‘Bones’ Baird he was inducted into the Carlton Hall of Fame. 1940 - Reserves Most Unselfish Player Award. Baird also wore guernsey no. 29 whilst playing with Carlton Reserves in 1940. Contributors to this page: Jarusa , PatsFitztrick , molsey , Bombasheldon , WillowBlue , pblue , p(12)terg , true_blue24 and admin . Page last modified on Tuesday 16 of May, 2017 22:54:39 AEST by Jarusa. 1988 - Ian Herman profile (03/06/88).